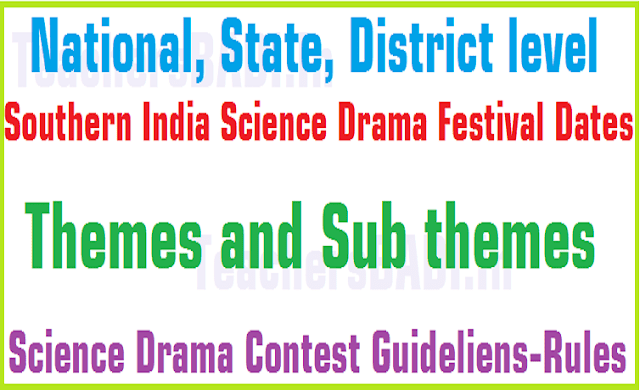 SISDF Science Drama competitions guidelines, Science Drama Contest guidelines, National,State,District level Southern India Science Drama Festival 2017, State,National Level Science Drama Contest 2017 dates, National Science Drama Festival themes,sub themes. Southern India Science Drama Festival - 2017 : The annual event Southern India Science Drama Festival will be organised at Visvesvaraya Industrial and Technological Museum, Bangalore during the first week of November 2017. The attention of all the District Educational Officers in the state is invited to reference 2nd cited, that the Director, Visvesvaraya Industrial and Technological Museum (V.I.T.M. ), Bangalore has informed that South India Science Drama Festival (SISDF) will be organized at Visvesvaraya Industrial Et Technological Museum, Bangalore during the first week of November 2017. Similarly, first prize and second prize winners of SISDF will also participate in the National Level Science Drama Festival, to be organized by National council of Science Museums at Nehru Science Center, Mumbai in the month of January, 2018. Vide ref (2) cited, this office has already communicated the orders on the conduct of District level competitions and to communicate the list of the winners to this office on or before 30.9.2017, so as to enable this office to take further action to conduct State level Science Drama Festival during 2nd week of October 2017. Instead of Godavari hall as is cited in ref P. The venue is shifted to Keys High School, Secendrebad for the conduct of State level Science Drama Festival 2017 on 10-102017. Therefore the DEOs and DSOs are requested to send erstwhile district level 1st prize winner to Keys High School, Sec-bad on 10-10-2017 at 10.00 A.M.
Sub: S.C.E.R.T., Telangana., Hyderabad - Conduct of Southern India Science Drama Festival - 2017 - Instructions - Issued. Read:- Lr. No. VM 24(18)/EDEXT/SISDF-2016/469, dated 10-06-2016 from Director, Visvesvaraya Industrial and Technological Museum, Bangalore. The attention of all the District Educational Officers in the state is invited to reference read above, that the Director, Visvesvaraya Industrial and Technological Museum (V.l.T.M. ), Bangalore has informed that South India Science Drama Festival (SISDF) will be organized at Visvesvaraya Industrial & Technological Museum, Bangalore during the first week of November 2017. Similarly, first prize and second prize winners of SISDF will also participate in the National Level Science Drama Festival, to be organized by National council of Science Museums at Nehru Science Center, Mumbai in the month of January, 2018. The main theme for National Science Drama Festival is Science & Society. They are therefore requested to organize the District level Southern India Science Drama Festival 2017 on the topic of this year is Science & Society with sub• themes "1. Green Energy, 2. Digital India, 3. Swachh Bharath : Role of Science and Technology, 4. Cleansing of Rivers" at their convenient date and it should be completed on or before 30th September 2017. The Basic information, Rules & regulations and a brief guideline for the preparation/presentation for the conduct of State level Science Drama Contest are enclosed for ready reference. The same may kindly circulate to the participants/schools to have maximum participation. The date and venue of the district level science drama contest 2017 may please be intimated to the Director, VITM, Bangalore and to the Director, SCERT, TS, Hyderabad. The list of the winners at District Level shall be sent to this office on or before 30.9.2017, so as to enable this office to take further action to conduct State level Science Drama Festival during 2nd week of October 2017. The DEOs and DSOs are requested to organize the Science Drama Festival by grvmg wide publicity to enable the interested students to make adequate preparation to participate in the event not as just routine affair. Further they are requested to identify the potential schools which are strong in doing cultural programmes and equip them to participate in the District and State event with better performance so as to compete with the other States. Telangana State has good reputation at the National level in presenting the cultural programmes, we all should strive to uphold the reputation of the State in such events. The script of the drama must fall under any of the above sub topics. 1. The drama should not be an academic exercise and uninteresting. lt should convey emotional, as well as aesthetic experience to the performers and also to the audience. 2. It should totally engage the audience and convey educational message. 3. While writing the script. care should be taken regarding the setting. duration of the play and also the number of actors taking part in the drama. 1. Duration of the play should not be more than 30 minutes. 2. There should not be more than 8 characters in the team (as a team for easy mobility). 3. It should convey scientific message related to the theme as mentioned above. 4. The drama team should be able to set-up props and other necessary requirements to stage within 5 minutes. 5. The language should be easy to follow (more of visuals theatre preferred). 7. The drama may have costumes. dance, music, mime and also models to enhance the interest and credibility of the drama. 8. Written poster / banner / Audio-Visual Aids can also be used for illustration. 9. The participating school has to submit an authentic Hindi I English translation of the script to the organisers welt before staging the drama in case the drama is being performed in any other official Indian language. 10. Education Dept of each State shall select Top Two Best Dramas from their State level contest and nominate for the Southern India Science Drama Festival to be held at VITM. V. Prizes may be awarded in cash or kind as detailed below in the Southern India Science Drama Festival. The panel of Judges may or may not recommend prizes if the dramas are not upto the expected standards. Best play- 3 prizes( First, Second and Third prizes will be awarded based on the overall performace by the team members) First two prize winning dramas of SISDF-2017 will participate in the National Science Drama Festival 2017.